On Sunday evening (Oct. 13), the Music City Center hosted its first big music-biz event and hit a homerun. 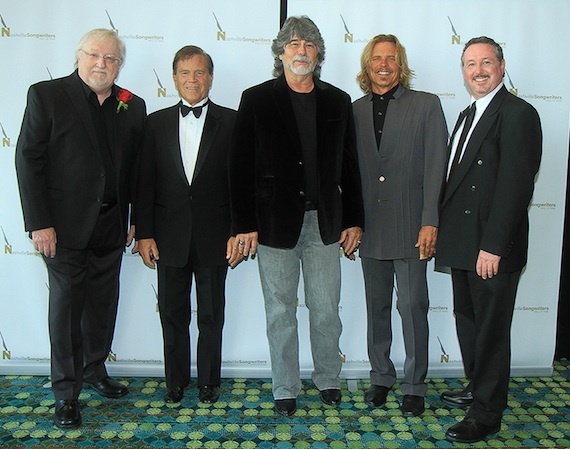 The occasion was the 43rd annual Nashville Songwriters Hall of Fame banquet coupled with the NSAI honors. Which is fitting, since the Nashville Songwriters Hall of Fame’s interactive gallery became the anchor attraction in the colossal convention center when it opened in May. The venue’s gorgeous grand ballroom, which can hold 6,000, was partitioned to suit Sunday’s 1,000 banquet attendees. The facility’s catering scored a bullseye, offering nicely presented surf & turf with roasted fingerling potatoes and squash medallions. Deliciously light mousse desserts were the finale. Big Al Anderson rocked on Jeffrey Steele’s “Unbelievable,” and Aaron Lewis soared on “What Hurts the Most.” Richard Leigh hushed the room with his reading of “The Greatest Man I Never Knew,” which he co-wrote with inductee Layng Martine Jr.
“The songwriters have definitely moved uptown, folks,” said Hall of Fame board president Pat Alger of the spectacular new site for the gala. “I’m incredibly honored to represent this amazing organization tonight. Think about what it takes to get here.” Alger is a Hall of Famer, as were many others in the audience. Jeffrey Steele’s induction came first. Bob DiPiero set the record for length of induction speech. Craig Wiseman set the record for length of musical medley. Steele set the record for length of acceptance remarks. “My God, I’ve been doing this for 35 years, and it’s been an absolutely incredible journey,” Steele said. Next up was Layng Martine Jr. Ray Stevens, who was instrumental in the songwriter’s early acceptance and success in Music City, sang strong versions of both “Way Down” and “Rub It In.” Hall of Famer Wayland Holyfield inducted Martine. Reba McEntire offered video congratulations. Publisher Lance Freed inducted Will Jennings, recalling that the Texas native and former University of Wisconsin English professor began his song career in Nashville. Jennings was “coming home,” Freed said. Steve Winwood, one of the songwriter’s most prominent collaborators, played their “Higher Love” and offered congratulations via video. Jennings, who could not travel because of doctor’s orders, accepted via video. In addition to Jamey Johnson, Randy Owen was saluted in song by Kree Harrison (“Feels So Right”) and Connie Smith (“Lady Down on Love”). The Alabama front man’s wife, Kelly Owen, offered adorably amusing remarks about what it was like to be a songwriter’s spouse. “My songs are very personal to me,” said a grateful Randy. “With all the talent here tonight, I feel very small. “I still can’t get over one of my songs being sung by Connie Smith,” he remarked backstage afterward. Alger also introduced Mark Ford as the Nashville Songwriters Hall of Fame’s first executive director. Ford and the Bluebird’s Erika Wollam Nichols produced Sunday’s show. The NSAI’s Bart Herbison and Lee Thomas Miller began the evening by presenting awards to the writers of the “10 Songs I Wish I’d Written,” as voted on by their organization’s songwriter members. “How cool is it to finally have a Hall of Fame dinner in a place where there is an actual Hall of Fame?” said Herbison. The 10 songs honored were “Better Dig Two,” “Cruise,” “Hard to Love,” “Highway Don’t Care,” “I Drive Your Truck,” “Like Jesus Does,” “Mama’s Broken Heart,” “Merry Go Round,” “Pontoon” and “Wagon Wheel.” Connie Harrington, Jimmy Yeary and Jessi Alexander expressed emotional thanks when their “I Drive Your Truck” was named the NSAI’s Song of the Year. The song, which received MusicRow‘s Song of the Year honor earlier this year, was inspired by a true story. It is about the heroic combat death of a soldier and his father’s response to it. The NSAI’s Songwriter of the Year award was given to Rodney Clawson. “Ten years ago, I was driving a tractor back in Texas, dreaming of something like this,” said Clawson. Bazillion-selling Taylor Swift set a new record by being named the NSAI’s Songwriter-Artist of the Year for the sixth time. She said she plans to display all six trophies in the Taylor Swift Education Center in the Country Music Hall of Fame, which she opened Saturday morning (Oct. 12). The gala was attended by a real who’s-who of the Nashville music industry. Taking in the awesomeness of the Music City Center were Bobby Braddock, Bobby Rymer, Bob McDill, Leslie Roberts, David Briggs, John Briggs, Jon Randall Stewart, John Scott Sherrill, John Mabe, John Bettis, Tim Fink, Tim Wipperman, Steve & Ree Guyer Buchanan, Steve O’Brien, Steve Bogard, James Elliott, Rep. Jim Cooper, Jim Weatherly, Mark Wright, Mark D. Sanders, Marcus Hummon, David Maddox and David Bellamy. Everyone who is anyone appears at this annual extravaganza. Pat Higdon, Pat Rogers, Jack Brumley, Jackie Peters, Melanie Howard, Perry Howard, Judy Kilgore, Judy Harris, Karen Conrad, Kathy Louvin, Kye Fleming, Kerry & Corky O’Dell, Kay Williams, Kim Williams, Jody Williams, Mary Dale Frank, Dale Bobo, Jerry Salley, Gary Burr & Georgia Middleman, Jeff & Terri Walker, Terry Brown, Roger Cook, Roger Murrah, Dean Dillon and Mayor Karl Dean mingled. Deborah Allen reports that she has a new holiday CD on the way. She’s also going to be starring in the Christmas show at Fontanel in November and December. Even Stevens is hosting “The Originals: Inside the World of Songwriting” weekly on Hippie Radio on Sunday evenings. On it, he broadcasts the demo versions of famous hit songs. Go to hippieradio945.com to listen, or tune in. Other greats in attendance included Max T. Barnes, Harold Shedd, Ralph Murphy, Earle Simmons, Mike Dungan, Scott Borchetta, Wynn Varble, Fletcher Foster, Sherry Bond, Sonny Curtis, Rick Sanjek, Stacy Widelitz, Liz Hengber, Clay Myers, Brian Buchanan, Whitney Daane, Celia Froelig, Billy Yates, Dennis Morgan, Tracy Gershon, Dickey Lee, Rep. Marsha Blackburn, Don Cusic, Freddy Hart, Bucky Wilkin, Sherrill Blackmon, Rita Allison, Woody Bomar, Matraca Berg, Rory Bourke, Hugh Prestwood, Susan Stewart, Alecia Warwick, Ron Cox and Hank Adam Locklin. Newly anointed Tennessee Film & Entertainment Music Commissioner Troy Tomlinson eloquently reminded the dignitaries to continue their financial support of the Nashville Songwriters Hall of Fame.